With 5 different pools, this is the best place to come for a family swim in the Dunedin area. If you want to swim laps, there’s a pool for you (heated to 28 degrees). If you’re after a rapid river, waves and a play, the leisure pool is for you (heated to 32 degrees). 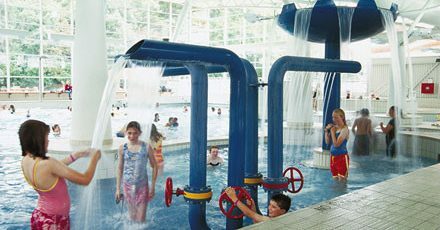 And of course there are 2 hydroslides, water features like fountains and a separate toddlers’ pool (also heated to 32 degrees) to one side of the leisure pool. There’s even an indoor beach area! There’s one slow slide and one fast. For those under 10 years old, using the slides, an adult needs to be supervising by waiting at the bottom. Kids under 5 need to go down the slides with an adult accompanying. Other family fun is to be had with the inflatables during the school holidays and sometimes at the weekends (phone to check). All kids aged 5 and under need an adult (aged 16+) in the water with them. Kids aged 6-10 years need to be actively supervised from the side of the pool (i.e. watching at all times and be prepared to give assistance if needed). Open: daily. Leisure Pool from 5.30am – 9.30pm weekdays and from 7am – 7pm Saturday and Sunday. Leisure pool water features start from 10am. Water slides operate 3.30pm – 9pm (Friday during term time). Saturday & Sunday 10am – 5pm and during school holidays Monday to Friday 10am – 7pm. Price: Adults $6.70, School aged Kids $3, 1 Adult + 1 preschooler $4. Family Pass $14.50 (2A+2K or 1A and up to 4K). Hydroslide + Swim prices: Adults $12, School aged Kids $6.70, Family Pass $31.20 (2A+2K or 1A and up to 4K). A preschooler going down the slide must be with a paying adult.